The Starting Line – By Emily H.
For the last few days, I’ve been oscillating between nearly throwing up and a complete feeling of indifference. I know I probably won’t sleep well tonight, and I’ll need to get up early to make it to the final starting line on time. This starting line, however, won’t be like most of the others I’ve made my way to in the past because there will be no friends or family by my side, nor any smiling faces waiting at the finish line. No, this final starting line will have stern-faced exam proctors and a bunch of my fellow law school grads, who are probably as nervous as I am. Despite a full two months of preparation, I doubt any of us will feel 100% ready for the challenge we’re about to face. Today’s recommended task from my prep course included rest and relaxation, and I received an email from them this morning reminding me “that studying for the bar exam is a marathon, not a sprint.” This latter statement sort of helps explain the logic behind the designated rest day today, as you generally don’t run the day before a marathon. There’s a definite cross-over between preparing for the bar exam and running, and I hope to show you that there’s a cross-over to life in general as well. I’m training for my first half marathon in April, and wouldn’t you know that the 2 days before the race are supposed to be “rest days.” To me, this seems to make more sense than the rest days before an exam because it seems obvious that your body needs to recuperate before you go all-out on race day. However, I suppose it’s also true that running any distance race will require mental resilience if you’re going to finish. Perhaps the rest days before a race are as much for your brain as they are for your body. Maybe, just maybe, it all boils down down to mind over matter. It’s so easy to make excuses as to why we “can’t” do things, especially as people with physical disabilities because people let us off the hook too easy, so it requires great mental resilience to show up in the first place. 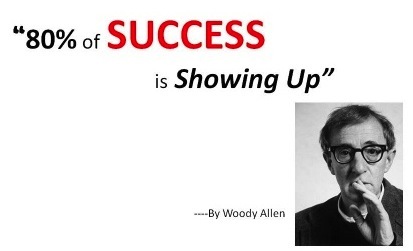 It’s no secret that there’s a 100% chance that a task will be impossible if you fail to show up in the first place. It’s not just showing up on the “big day,” either, it’s showing up for the “training” sessions as well. Life’s about so much more than just being the best at things. It’s also about having the courage to accept challenges and then motivating yourself to show up to the starting line every day that you designate as one in which you’ll work towards your goal. Whether you want to walk a mile, ride a bike, run a marathon, learn yoga, take up photography, or whatever else it might be, I encourage you to go out there and just show up to the starting line you choose. The rest is relatively easy.